LOS ANGELES, CA--(Marketwired - Feb 5, 2017) - SOLIDWORKS World -- NVIDIA (NASDAQ: NVDA) today introduced a range of Quadro® products, all based on its Pascal™ architecture, that transform desktop workstations into supercomputers with breakthrough capabilities for professional workflows across many industries. Workflows in design, engineering and other areas are evolving rapidly to meet the exponential growth in data size and complexity that comes with photorealism, virtual reality and deep learning technologies. To tap into these opportunities, the new NVIDIA® Quadro Pascal-based lineup provides an enterprise-grade visual computing platform that streamlines design and simulation workflows with up to twice the performance of the previous generation(1), and ultra-fast memory. Unify simulation, HPC, rendering and design - The GP100 combines unprecedented double precision performance(2) with 16GB of high-bandwidth memory (HBM2) so users can conduct simulations during the design process and gather realistic multiphysics simulations faster than ever before. Customers can combine two GP100 GPUs with NVLink™ technology and scale to 32GB of HBM2 to create a massive visual computing solution on a single workstation. "Customers count on Dassault Systèmes' simulation tools to easily create often massively detailed models, while minimizing cost and inefficiencies. We have seen significant acceleration of our Abaqus FEA software simulations on the new Quadro GP100, which helps unify traditional design and simulation workflows, and are eager for our customers tap into its power to gain a competitive advantage." "As a leader in workstation technology we know that all of our Dell Precision users rely on the best performance to push the boundaries of their creativity. The new Pascal based Quadro graphics help push the most powerful mobile workstation, the Precision 7720, to become the first VR-Ready notebook in its class, as well as enabling our tower workstations to create photorealistic renders faster than ever." "VR has had a huge impact on the AEC industry, having become an important part of design, planning and building. It is transforming Hensel Phelps' workflow and how we communicate designs and changes to our clients. We are excited about NVIDIA's new VR Ready P4000 as it delivers a terrific VR experience and because it's cost-effective. Now even more architects, designers and contractors will be able to tap into the power of VR on their desktops to give their clients the best experience and well communicated finished product possible." "HP Z Workstation customers are some of the most demanding GPU and CPU customers on the planet. Quadro Pascal will be supported across the HP Z Desktop Workstations portfolio, enabling our professional users to push their creative boundaries in product development, media and entertainment, AEC and anywhere that professional graphics are required." -- Josh Peterson, vice president of worldwide product management for HP Workstations, HP Inc.
"The new NVIDIA GP100 will be beneficial to our customers in industries such as design and manufacturing who require extreme compute capability for larger datasets. The unmatched power of the Lenovo ThinkStation P910 offers workstation users best-in-class performance with up to three NVIDIA GP100 GPUs, enabling customers in deep learning, AI and simulations to process more data in real time." "The NVIDIA Quadro P1000 enables me to work at the speed of thought. Orange County Choppers relies on a number of 3D CAD design and visualization tools to build the most innovative custom motorcycles in the world and the P1000 easily handles everything we throw at it. It's the perfect GPU for an ultra-compact workstation like our BOXX APEXX 1." The entire NVIDIA Quadro family of desktop GPUs will be on display at SOLIDWORKS World, starting today at the Los Angeles Convention Center, NVIDIA booth 628. NVIDIA Quadro will be powering the most demanding CAD workflows from physically based rendering to virtual reality. Visit our partners' booths to try the latest mobile workstations powered by our new Quadro mobile GPUs. (1) 2x performance claim based on SPECviewperf 12 benchmark results. (2) More than 5 TFLOPS, nearly 3x faster than Quadro K6000. (3) Single precision (FP32) performance is 10 TFLOPS; running in half precision (FP16) mode doubles the throughput to 20 TFLOPS. (4) More than 18 times faster than Intel Xeon E5 2697 V3 2.6 GHz 14-core CPU based on internal testing with Iray using 720p scenes. (5) Quadro drivers currently support configuring up to 16 4K displays using a single Sync II card. Functionality for up to 32 4K displays will be added to a future driver update. 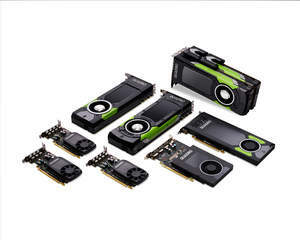 Certain statements in this press release including, but not limited to, statements as to: the performance, benefits, impact and availability of NVIDIA Quadro Pascal GPUs; design and engineering workflows evolving rapidly; and the impact of virtual reality are forward-looking statements that are subject to risks and uncertainties that could cause results to be materially different than expectations. Important factors that could cause actual results to differ materially include: global economic conditions; our reliance on third parties to manufacture, assemble, package and test our products; the impact of technological development and competition; development of new products and technologies or enhancements to our existing product and technologies; market acceptance of our products or our partners' products; design, manufacturing or software defects; changes in consumer preferences or demands; changes in industry standards and interfaces; unexpected loss of performance of our products or technologies when integrated into systems; as well as other factors detailed from time to time in the reports NVIDIA files with the Securities and Exchange Commission, or SEC, including its Form 10-Q for the fiscal period ended October 30, 2016. Copies of reports filed with the SEC are posted on the company's website and are available from NVIDIA without charge. These forward-looking statements are not guarantees of future performance and speak only as of the date hereof, and, except as required by law, NVIDIA disclaims any obligation to update these forward-looking statements to reflect future events or circumstances. © 2017 NVIDIA Corporation. All rights reserved. NVIDIA, the NVIDIA logo, Quadro, Pascal, CUDA and NVLink are trademarks and/or registered trademarks of NVIDIA Corporation in the U.S. and other countries. Other company and product names may be trademarks of the respective companies with which they are associated. Features, pricing, availability and specifications are subject to change without notice.